System that is secure, easy and convenient to use. Designed for professional and precise sharpening. 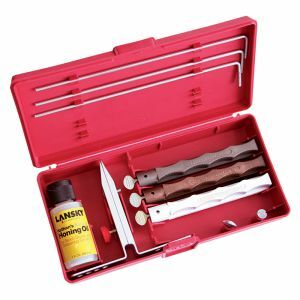 The kit contains three grindstone - for soft, hard and hard black stone Arkanzaski made with a comfortable grip for the fingers, lube to sharpening, stand, and three rods extending the sharpening stone and setting angle of sharpening. All this - in a convenient carrying case.